Ready to take on the timeless, textured look of cable knits? Then this stunning collection of 26 luxurious projects is for you! Renowned designer Martin Storey has a new collection of knits you’ll want to dive into with both needles, full of classic textured cable patterns and his trademark contemporary appeal. 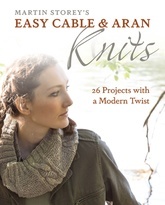 The versatile range of garments in Easy Cable & Aran Knits includes scarves, hats, mittens, shrugs, sweaters, cardigans, pillows and more. Start with the simple projects to learn the skills you’ll need then move on to more challenging designs. Its step-by-step instructions, beautiful photos, and easy-to-follow charts are all you need to start crafting handsome textured knits—like the fabulous fisherman’s sweater—in no time.